Think ‘Paris’ and immediately an iconic spot comes to mind: the Eiffel Tower, of course! Find out how you can wake up to the sight of the famous landmark. Well-known and famous for being one of Paris’ most popular attractions with 250 million visitors up to date; stand amidst the crowd at the Champ de Mars and gawk as you witness the daily light show or head up to the tallest peak and marvel at the city’s stunning skyline. We know it is hard to resist if you only had one breath-taking glance, so how about being near it for some proper swooning? Here, we give you the best of both worlds - the chance to revel in luxury while admiring an iconic beauty right outside your window! Take your pick from the 13 best Paris hotels with a ravishing Eiffel Tower view! 15 minutes away from the magnificent tower is Le Cinq Codet, the most favourite spot for tourists all around the world. Marvel at the Eiffel tower from the comfort of your own room, for most rooms have panoramic views of the iconic symbol. All rooms are air-conditioned with a seating area, with a flat-screen TV, minibar and a coffee machine. Surf the net with the mini Mac computer provided in each room, and feel refreshed in the private bathrooms fully equipped with the basic toiletries. The breakfast is said to be the best - simply try out the pancakes and scrambled eggs and you will understand. Enjoy the interior courtyard and patio, free bikes are always up for rental if you feeling for a good cycling adventure. Take a refreshing soak in the hot tub and Hammam, or go out to discover the art and architecture in the 7th district: the Musée d’Orsay just 2 km (1.2 miles) away. Located in central Paris just five minutes away from the Eiffel Tower, the guests in Hôtel de la Bourdonnais will be proud to say that they are able to view the magnificent tower from their room’s balcony. 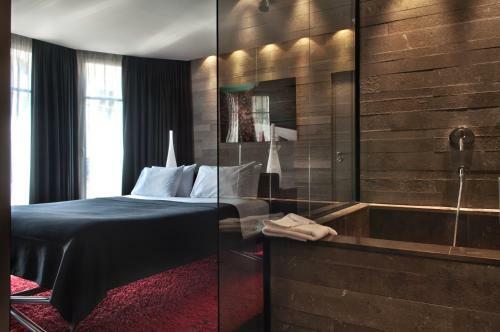 A pure example of luxury at its finest - each room features a flat-screen TV, a private bathroom with free Hermès© toiletries, and a coffee machine with a selection of coffee and tea. And if all that isn’t enough, ask the lovely staff for a Samsung phone for you to use throughout your stay. 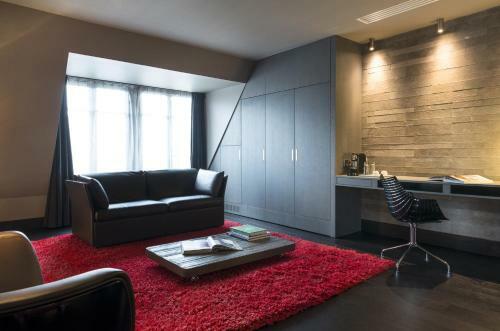 Designed and furnished in a travel and adventure themed-way, be inspired by the lavish architecture of Hôtel de la Bourdonnais and explore Paris for yourself. Just 200 m (656 ft) to the Ecole Militaire Metro Station (Line 8) gives you direct access to the Palais Garnier, while the Orsay Museum is a mere 1.6 km (1 mile) away. An eco-friendly hotel since 2010, this 18th-century building overlooks the lush landscapes of the Gardens of the Trocadero. 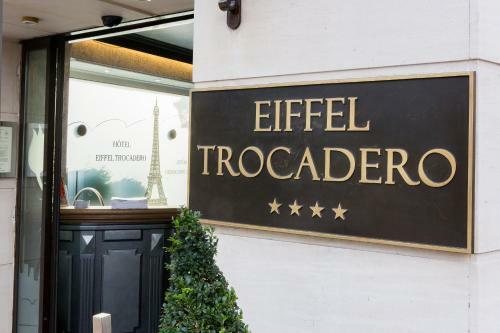 Save the earth with the Eiffel Trocadéro, a mere seven-minute walk away from the stunning tower. Though only some rooms offer you the ravishing view of the Eiffel tower; we assure you that all rooms are fully-equipped with strong air-conditioning, a flat-screen TV, a minibar and facilities for making hot drinks. The unique thing about this hotel is that the rooms are all interestingly decorated in period furnishings, a historic and elegant touch that many will come to love. An organic, fair-trade breakfast is served every morning, while the stone-walled bar serves shots when the sun starts to set. The Trocadéro Metro Station is just 180 m (590 ft) from the hotel, providing direct access to the Arc de Triomphe, and the Quai Branly Museum is just a 15-minute walk away. Located in Paris’ 15th Arrondissement and just a 15-minute walk to the dazzling Eiffel Tower; chic and elegance comes in the form of one here in Le Parisis - Paris Tour Eiffel. Admire France’s iconic beauty from the large windows of your contemporary and comforting hotel room, each room designed daintily with a stylish decor. Expect soft colours, pearl mosaics, and comforting L'Occitane amenities to rock each calming haven for the most tranquil stay. An American buffet breakfast will be served every morning in the breakfast room, while the bar comes to life every night with drinks and clinks. The 15th district is great for travellers in love with intricate architecture and famous monuments, as the La Motte-Picquet-Grenelle Metro Station is just 2 minutes away, where attractions such as The Arc de Triomphe and Place de la Concorde can be accessed directly. 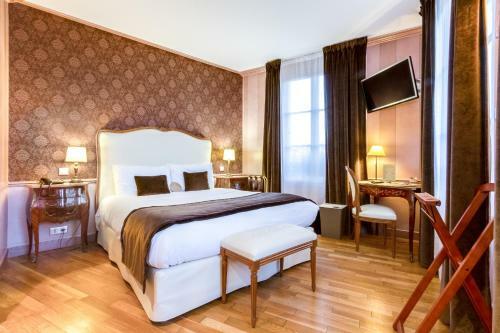 Just 12 minutes walk from the foot of the Eiffel Tower sits a beautiful quaint hotel called the Hotel du Champ de Mars. Clean, serene, cosy with authentic French decor - this hotel is all praise when it comes to its good looks and helpful staff. Each room individually decorated with some boasting a balcony with the mesmerizing Eiffel tower views; enjoy a flat-screen TV, a telephone, free toiletries and a hairdryer in the private bathroom. Breakfast can be provided every morning, and sometimes even to the doorstep of your room. Shuttle services to the city can be arranged at an additional cost. The Rodin Museum and the Musée d'Orsay are just a few steps away. Just a 12 minutes walk to the splendid Eiffel Tower lies a four-star luxury boutique hotel located on the River Seine’s right bank. Deeply infused with contemporary designs and modern technology, this highly personalised space is meant to impress and express. With an authentic and zen-like ambience for the most peaceful stay, opt for the rooms with the marvelous Eiffel Tower views. Each room is furnished with exposed stone walls, black hardwood floors, a minibar for midnight snacks, an iPod docking station, and luxury bathrooms with a rain shower. The excitement is hard to contain when night falls, for this impressive space boasts the first Veuve Clicquot champagne bar in Paris. Sip on cocktails and aperitifs at the La Grande Dame bar, or arrange for a massage from the Wellness Spa in the comfort of your own room. Head out to admire the best views of the Eiffel Tower from the Trocadéro, or explore the Pont de Bir-Hakeim just 200 m (656 ft) away. The Hotel Marignan Champs-Elysées is a posh five-star accommodation situated between Avenue George V and Montaigne, just 20 walking minutes away from the Eiffel Tower. A quintessence of Parisian elegance, this hotel allows you to indulge in the wide range of amenities provided in and near this premium space. From upscale restaurants, world-class bars, a cinema room, and designer brands nearby (think Cartier, Gucci and Chanel), enjoy your stay in Paris with the best and wisest choice. Some rooms feature a private terrace with views of the Eiffel Tower, providing the best chance for guests to dine alfresco with the charming tower view. All rooms are air-conditioned and designed with marble and oak furniture for a more elegant and prestigious vibe - decked completely with an HD flat-screen TV with satellite channels, an iPod docking station and a private bathroom. Get to know the art scene in Paris with the Petit Palais art museum just 11 minutes walk away, and the Champs-Elysées a two minute walk away. Situated seven minutes away from the enchanting Eiffel Tower, lies a hotel with such romantic history that it would be a pity if it is missed. An expensive gift from a rich Russian entrepreneur to a Parisian girl he fell head over heels for in the late 1920s, this romantic and exquisite hotel has since been a classic spot for lovers in the City of Love. Though most rooms and suites overlook the quiet Avenue de Friedland or the hotel’s green interior courtyard; there are two luxurious suites that give you a magnificent view of the Eiffel tower. Spacious and sophisticated with immaculate decor; each room is fully equipped with an LCD flat screen TV, air-conditioning, and modern marble bathrooms. Dine in Napoleon’s most well-known restaurant - the Bivouac Café - where the gourmet cuisine and bar has a sheltered terrace with a fountain. Experience and sightsee in Paris: the Arc de Triomphe is a mere two-minute walk away, while the Parc des Princes Stadium is 15 minutes away by car. An authentic Parisian boutique hotel dating back to the 20th century, this elegant space is just a 15 minutes walk from the Eiffel Tower. Eco-friendly with original engravings by Picasso and Matisse - experience and discover what luxury really means within the walls of each prestigious and intricately-decorated room. 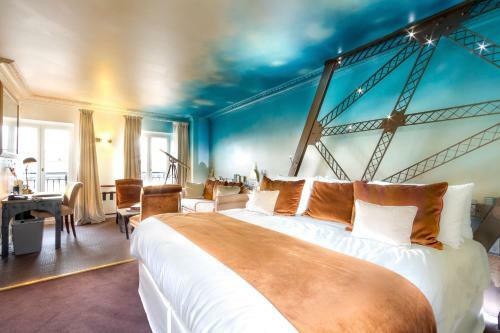 If you are looking for a chance to sleep within the sight of the marvelous Eiffel beauty; look no further, for the Eiffel suite for two will be just what you are looking for. Top suites have the privilege of soaking in their very own whirlpool tub, and breakfast is served every morning at an additional cost. Take part in daily champagne-tasting events from Le Dokhan - the first ever champagne bar in Paris that boasts a span of 240 different types of champagne and wine. Guests will be pleased to find out that the nearest metro station is just 500 m (0.31 miles) away (Trocadero Station) and the other tourist attractions like then France Miniature and Palais de Chaillot is just a 10 minutes walk away. Relish in a five-star peaceful haven near the Champs-Elysees and the Arc de Triomphe, the Raphael hotel, just a few streets away from famous fashion boutiques and museums. A quintessential French-luxury since 1925, take a 20 minutes stroll to the Eiffel Tower to truly understand what everyone is gawking about when the topic of this iconic structure comes to mind. Or simply, marvel at it from the top floor terrace at the gastronomic English Bar & Lounge with a cocktail in hand. Each room features wooden furnishings, elaborate wall-hangings and a minibar for late-night fuel. Guests that crave 24/7 for the magnificent Eiffel view should opt for a balcony suite with a lounge area. Raphael is also proud to present an award-winning chef that whips up delicious French cuisine in the sophisticated hotel restaurant. For those restless guests who think that staying in a hotel can start to get stuffy; go around it - for the Etoile Metro Station is just 400 m (0.24 miles) away, providing direct access to the Louvre Museum and the Grand Palais. 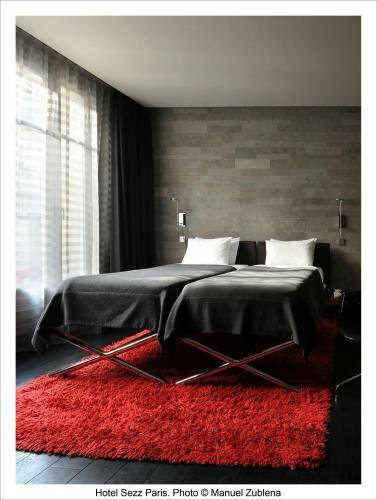 Located in the heart of Paris, Résidence Charles Floquet proves uniquely capable of transforming your next prospective visit to Paris into a winning one. It is set in a renovated, historic building, steps away from the Eiffel Tower, meaning that you’ll be able to enjoy a close-up view of the magnificent architectural gem. Its central location promises to introduce you to all of the sights and sounds in the locale, including the Army Museum and the Bir-Hakeim Metro Station, which leads directly to the Arc de Triomphe. Furnished in an elegant neutral color scheme, the apartments at Résidence Charles Floquet are fully self-contained as each of them comes with a well-appointed kitchen consisting of a dishwasher, a coffee machine, a toaster, a washing machine, and a tumble dryer. It is also fitted with a wide range of mod cons to make you feel right at home, including free Wi-Fi access, a satellite TV, and a Blu-Ray player. Add to that the fact that you’ll be gifted with high ceilings, lovely balconies, cozy fireplaces, and you’re in for a privileged stay in Paris. Listed in the French “Monuments Historiques”, the Shangri-La hotel faces the Eiffel Tower and is located just across the Seine. Foodies will be pleased to know that the hotel has three restaurants (two of which have a Michelin star). 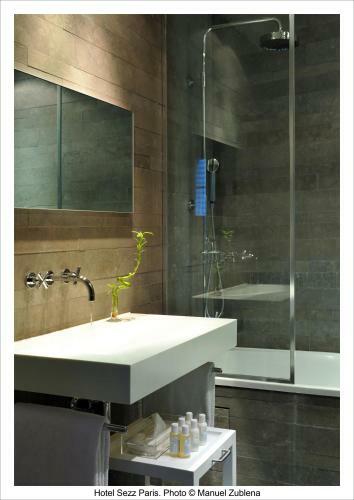 All rooms have a living room, elegant marble bathroom with a bath and rainfall shower, flat-screen TV, iPod dock and a laptop safe. For guaranteed views of the Eiffel Tower, be sure to select rooms/suites with “Eiffel Tower view” in its room name – there are many options available on Tablethotels. Enjoy a free trial of Tablet Plus for upgrades and privileges! 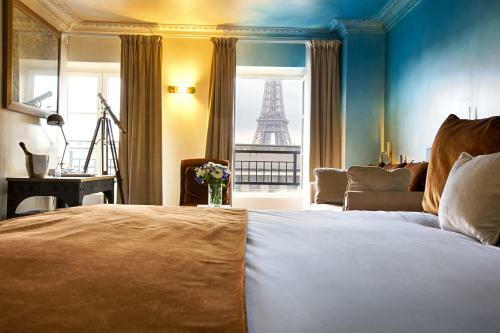 All rooms at this boutique hotel boasts incredible views of the Eiffel Tower. You can either select a room with a front view or a side view (with some rooms having private balconies). 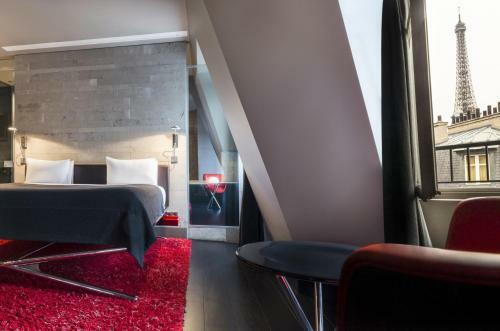 Rooms are simple yet elegant and has a flat-screen TV and complimentary Wi-Fi so you can stay connected (and post those beautiful Eiffel Tower photos on your social media). Witness the glimmer & shimmer in the City of Love! As hard as it is to believe, did you know that this iconic beauty was once deemed as unsightly and on the verge of being torn down? It is truly remarkable how the world slowly evolves and how people’s thoughts start to change! Whether it is for the better or the worst, we are glad that the Eiffel Tower still stands tall and pretty today. France’s dazzling capital deserves a symbol so magical and alluring it is hard to keep our gazes away, so pack your bags, book your hotel and get swooning, for this lovely city will be sweeping you off your feet! Be Charmed By Grasse, France: These Are The Best Places To Stay!